Producing man-made diamonds, either by HPHT or CVD methods, is quite costly. The fact they can be sold for a third or less than a natural diamond suggests they are often priced relative to natural diamonds, rather than priced in a way that reflects a true market for synthetics. Like most technologies, however, note that innovations may bring down production costs and, accordingly, the demand for them will increase. 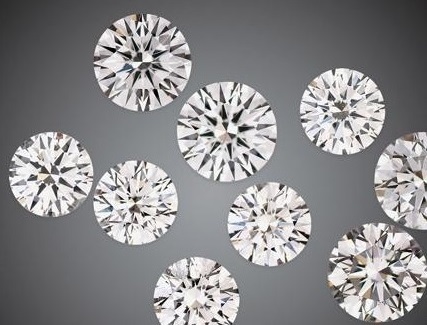 Colorless gem-quality CVD-grown man-made diamonds such as these (0.22-0.31 ct) are commercially available, making proper identification important. No one knows for sure if man-made diamonds will become a popular choice for shoppers long term. There are personal choice issues for each buyer to consider before they purchase one. It is up to the preference of the consumer whether they purchase a natural or synthetic diamond, however, proper disclosure about the nature of their stone is paramount. As long as the origin of the diamonds is fully disclosed, consumers and the market will determine the future for synthetic diamonds.